Evaluating active managers’ performance through a risk lens is rooted in modern portfolio theory (MPT), which states that the expectation of returns must be accompanied by risk—the variation (or volatility) around the expected return. MPT assumes that higher risk should be compensated, on average, by higher returns. Institutional investors tend to be interested in risk-adjusted returns. In addition to the performance of managers hired to manage their assets, institutional investors also look at the risks managers take to achieve those returns. With that in mind, we initiated the first Risk-Adjusted SPIVA Scorecard, which seeks to establish whether actively managed funds are able to generate higher risk-adjusted returns than their corresponding benchmarks over a long-term investment horizon. In our analysis, we used the standard deviation of monthly returns over a given period to define and measure risk. The monthly standard deviation was annualized by multiplying it by the square root of 12. The risk/return ratio looks at the relationship and the trade-off between risk and return. All else equal, a fund with a higher ratio is preferable since it delivers a higher return per unit of risk taken. To make our comparison relevant, we also adjusted the returns of the benchmarks used in our analysis by their volatility. Given that indices do not incur costs, we also present gross of fees performance figures by adding the expense ratio back to net of fees returns. In this way, all else equal, higher risk taken by a manager should be compensated by higher returns. Exhibits 1 and 2 look at the percentage of domestic and international managers outperformed by benchmarks, using risk-adjusted returns on gross of fees and net of fees bases over 5-, 10-, and 15-year investment horizons. We observe that large-cap value funds (over 10 years) and real estate funds (over 5 and 15 years) outperformed their respective benchmarks when using gross of fees risk-adjusted returns, indicating that fees played a major role in those categories. Similarly, in international equities, we find that fees contributed meaningfully to the underperformance of international and international small-cap funds. 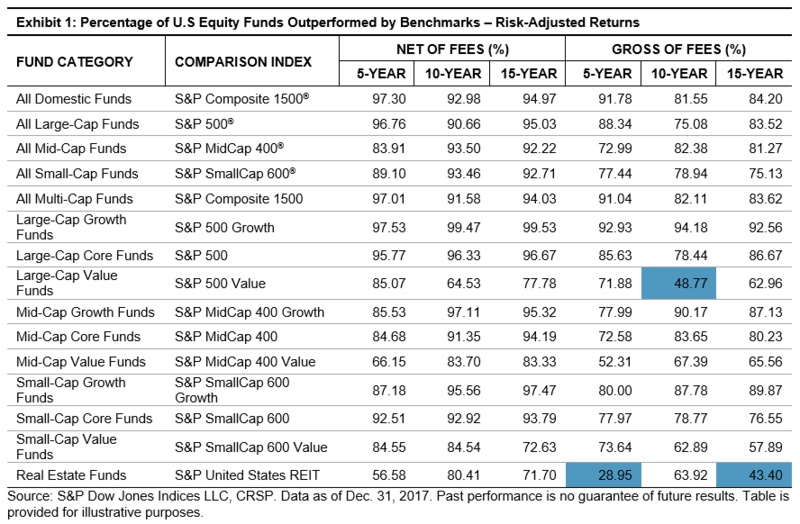 For example, when using gross of fees returns in the risk-adjusted performance analysis, funds in those two categories outperformed the benchmarks over 5- and 10-year periods. When net of fees returns were used, the majority of managers across all categories underperformed the benchmarks. The evaluation of active managers’ performance through a risk lens is an integral part of the investment decision-making process. However, as our study highlights, actively managed domestic and international equity funds across almost all categories did not outperform the benchmarks on a risk-adjusted basis. The figures improved for some categories when gross of fees returns were used. Therefore, we did not see evidence that actively managed funds were better risk managed than passive indices. See the full report here: Risk-Adjusted SPIVA Scorecard.